res, including detailed descriptions of treating lameness incorporating the most current research in this area. The significantly updated text covers a wide range of topics, such as pre-surgical preparation, ethics, effective anaesthesia and analgesia, pain management, supportive therapy, diagnostic techniques, and routine hoof care in cattle. The chapters are organised to cover particular systems including surgery of the abdomen, head, female and male reproductive organs, the musculoskeletal system, and teat surgery. 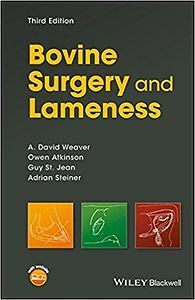 Equally useful for practising bovine veterinarians and for veterinary students on clinical rotations, as well as dairy herd managers and foot trimmers, the new edition of Bovine Surgery and Lameness is an essential resource for common surgical techniques for cattle and the most up-to-date guidance on lameness.